Over the last year or so I’ve been getting increasingly interested in gold, including physical gold, gold ETF’s and even gold backed crypto currency. You may have no interest in gold at all but bear with me as what I have to tell you could have a massive impact on your future. Besides, there’s a freebie up for grabs here and it’s a freebie with a difference, one that could potentially grow to become very valuable in its own right. It started when I reviewed the excellent Gold & Silver For Life program towards the end of 2016. It wasn’t until then that I started to appreciate the importance of gold as a store of wealth, as a means of exchange, as a superb investment in its own right (10%+ annual gains just holding it!) and, perhaps most importantly, as a protection against what many believe to be an imminent collapse, and reset, of fiat currencies. Before then I didn’t own any gold and never really saw the point. I understood that leaving money in the bank was a waste of time as it eroded my savings by round 3% a year due to inflation. But I always tried to put my money to ‘work’ in trading accounts, or in investments as a way of producing an income, so the idea of owning gold seemed irrelevant. As a member of the Gold and Silver For Life program I was invited to a client’s reception in London last year and had the pleasure of meeting a chap by the name of John Butler. He’s a clever man. He spent twenty years working in international finance on both sides of the Atlantic and had written a book called “The Golden Revolution, Revisited… How to prepare for the Remononetization of Gold”. He spoke to us that evening about why it’s important for everyone to have a least a portion of their total wealth in physical gold, no matter how small that may be, including those on low incomes. At the moment less than 1% of the world population own any gold whatsoever! Harald is the CEO of Karatbars. He’s also the Senator of the BWA (German Overseas Trade Association) and represents Germany on trade missions. He’s a prolific speaker and a published author. On the red carpet at Canne! He’s also been voted one of Germany’s top entrepreneurs in 2018. He wants to bring gold to the masses and in a way that will protect them from financial meltdowns. You see Mr Seiz, being the representative for Germany on trade, is only too aware of the impending issues arising from fiat currencies and the central banks addiction to printing money. We all know that the more money you print, the less it is worth. 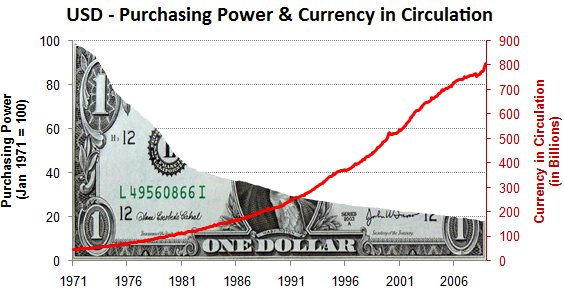 The deliberate inflationary effects of money printing have a proportionally detrimental effect on buying power. Essentially, real wages stagnate or shrink even in economies where productivity is growing. Without wanting to get technical, the long and short of it is… if you have fiat currency, be it dollars, pounds, euros or whatever it is losing value at an alarming rate, due to inflation, and it’s only going to get worse. If, however, you bought gold with your fiat currency, it actually grows in value over the long term. Since 2001, gold has increased in value on average by 10% a year against the dollar, or 12% a year against the pound. So this would reasonably lead you to believe that gold is worth $42.64 per gram. Yet if you go online to buy 1 gram of gold, you would be hard pressed to pay any less than $65-$75. This is because the ‘spot price’ is essentially the price that you get on the stock market when you buy a minimum of 3110 grams (100 troy ounces). So you need to spend $132,610 to get the gold delivered at that price, and then you’re going to have a massive gold bar to look after securely. Also, if you wanted to cash in some of that gold, say you needed $10,000 for a new car or something, then how are you going to sell it? You can’t saw it up and try to flog a lump of gold. And this is where Harald Seiz spotted a problem that needed solving and why he came up with Karatbars. His company sells the highest quality, pure 24 karat 999.9 gold from an LBMA accredited refinery, in affordable amounts from 0.1g to 6g weights. Each gold bar comes with a certificate of authenticity, is marked with a security hologram, a serial number, and fraud proof DNA coating. You cannot buy the same grade of gold, in the same quantities, with the same security features for a lower price anywhere. And you can buy a gold bar for as little at £6! Not only that, you can store it in their vaults completely for free if you don’t want to take delivery and, perhaps the most important point… they have a guaranteed buy back price of 7% below retail. And this is the biggest problem with buying gold… liquidating it. You see, you can buy gold from anywhere, but the problem with buying gold is knowing you are buying genuine gold (loads of fake gold on the market), storage costs, and then trying to sell it if you need to liquidate some for cash. With Karatbars you have none of these issues. The Karatbars security features guarantees you have the genuine article which means they are perfectly happy to guarantee a buy back price should you need to liquidate at any point. Karatbars has half a million customers in 125 countries and is endorsed by Moto GP, Real Madrid (yes, the richest sports club in the world!) and even the Vatican! It’s private, debt free and in the top 2% of German companies. Just when I thought I had found the perfect solution to buying physical gold and that was the end of it, it turns out that this is just the beginning. You see, Harald Seiz doesn’t just want ordinary people to be able to own gold. He wants them to be able to use it as a means of exchange… as an actual currency! Not only does CashGold look like currency, it has more security features than a £20 note, but you can now use it as currency in any K-Exchange, or even pay for things directly with your gold using their KaratPay app. They are still in pre-launch on the KaratBank ICO, and you can get a 30% pre-sale bonus on any coins you buy until the end of today. But how would you like some KaratCoin for FREE? Get this… for every 1 gram of CashGold you buy you will get 200 KaratBank Coins for free during the pre-ICO and ICO period. This is a limited time offer because once all the coins put aside for the early mover promotion period have been allocated, then that is it. For those of you that are existing Karatbars affiliates or customers, this promotion also applies to you. Just go to product purchase within your back office and you will see CashGold in the drop-down menu – buy 1 gram or more and you will get 200 or more KaratCoin for free. CashGold is an incredible way to save for the future because you don’t have the normal problems associated with parting with the gold if you need to. And anyone can get into this because CashGold comes in denominations as small as 0.1 grams. One 0.1 gram CashGold note costs just €5.86 (£5.16) right now. That amount will get you 20 free KaratBank coins and it will kick you off on a path to saving something for your future that has real value. What if the crypto currency were to grow to be worth just £1 per unit? You basically got 20 of them for every 0.01 of CashGold you purchased. That means you have £20 of crypto currency for a purchase of CashGold that cost you just £5! And you still own the gold! How can we be sure what KaratCoin will be worth? Because it’s backed by physical gold! 20% of all company profits from Karatpay/Karatbank will go towards buying physical gold which will be placed in the vault in Singapore. This will accumulate until there is 0.1g worth of gold for every Karatbank coin that exists. Right now it is 4% but as the pot increases so will the percentage until 1 x Coin will be backed by 0.1g CashGold (Which would be €5.86 today). Think about it. 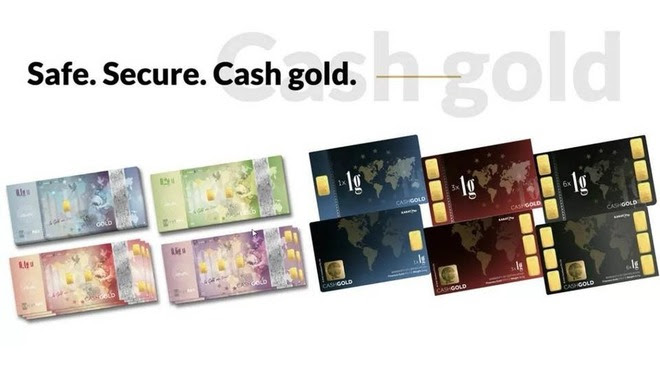 You can buy 0.1g of CashGold now for €5.86 and get 20 KaratBank Coins for free which is going to be worth at least 0.1g of CashGold EACH. So that’s a 20x return on investment, plus you still own the gold! You can buy more, and I would suggest you buy at least 1 gram of CashGold that gets you 200 coins while the bonuses apply. Here we have a really good way to get our hands on 20, 100, 200, 600 or 1,200 (or even more) of these coins that are being sold in the upcoming ICO genuinely for free just by putting some money into something else that is going to help our future anyway. Plus you can buy CashGold with debit cards, credit cards and bank wire transfers, so you don’t need to know anything about crypto currencies or have any BitCoin or Ethereum to get your gold. CashGold has been designed not only as a store of wealth but to be used as a means of exchange, as a currency, and so if you wish to purchase KaratCoin in the ICO you can even use your CashGold to buy them! For every 1g gram of CashGold you can buy 8500 KaratCoin! And remember each one of those are expected to be worth at least 0.1g CashGold each so that would be an 850x return on investment! This offer is only available until 18th March, but if you’re interested in getting some KaratCoin, or some more KaratCoin, then buying them with CashGold is by far the best option. Less than €0.01 cent per token! 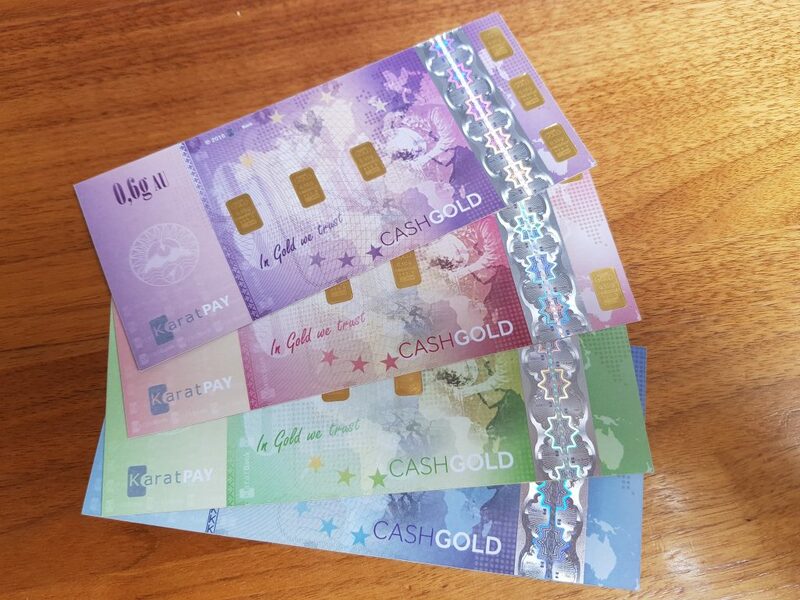 The only requirement is that you buy the CashGold and load it to your Karatpay wallet before the 18th of March. So until midnight CET on the 17th of March to be sure. You can swap the CashGold for tokens AFTER 18th but you must have bought the CashGold and loaded it to your Karatpay wallet before 18th March. Well, here’s what you need to do. If you are already a Karatbars member, perhaps you signed up during the member’s only pre-ICO stage a few weeks ago, then simply log into your account, click on Product Purchase and then CashGold. If you’re not already a member, go to this website, and sign up for free. Then login, go to Product Purchase and then CashGold. Once you have bought your CashGold you simply click on KaratPay (on the navigation bar at the top). Next, click on ‘Login Link For KaratPay’ and sign up for a KaratPay wallet. Next go back to the Karatbars back office and click on KaratPay . Load E-Wallet. You’ll then be able to load the CashGold into your E-Wallet which will show up when you login to your KaratPay account. The more you buy, the more free KaratCoin tokens you will receive. You can either keep the CashGold, or spend it directly on KaratCoin, or perhaps keep some and spend some on KaratCoin. To do that go to the KaratBank ICO page here and register. You will then be able to log in and purchase as many tokens you like using your CashGold. And remember, even if you did nothing but buy some CashGold and sit on it, you’ll be protecting your funds from inflation plus you’ll be automatically investing in a potentially lucrative crypto currency for free. You’ll also be able to cash in your CashGold whenever you like, instantly, or spend it anywhere that accepts CashGold either online or in physical retail outlets that are growing in number daily. And of course you can send CashGold to other people directly through the KaratPay app, just as you would send crypto currencies with wallets, or fiat currencies with apps like PayPal. Personally I’ve gone for all of it! I’ve already bought some KaratBank tokens (KaratCoin) but will certainly be taking advantage of this free offer by buying some more CashGold to store in the KaratPay wallet, and some to spend on more KaratCoin at a massively reduced rate. Remember you have until Sunday to take advantage of this offer. Any questions, drop me an e-mail and I’ll be happy to help.